I use a smattering of endearments from Sweetie to Darling, my niece has even been called cup cake before now and without too many objections! My other endearment is as you’ve guessed sweet pea. Just sort of trips off the tongue don’t you know sweetie dhaarling. And what a history this sweet scented cut flower has! Sweet Peas were introduced to the UK in the 17th Century from Sicily by a Sicilian monk, Franciscus Cupani (you can still by the Cupani bi-coloured Sweet Pea to this day). I don’t know about you but growing flowers with such a history tickles me pink, think of all the previous growers and their lives and loves. Fascinating. 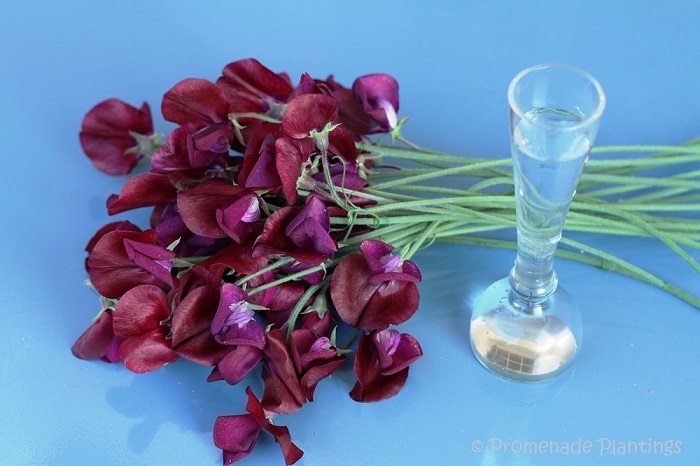 The name “sweet pea” comes from “lathyros,” which is the Greek term for “pea” or “pulse” and from “odoratus” which is Latin for “fragrant.” The sweet pea is said to symbolise blissful pleasure and delicate pleasures. What could be better than a vase of scented blissful pleasure? I missed the October sowing dates but sweet peas are fine and dandy started in February / March. Sown outside 6 to a 7/9 inch pot of compost, planted out in a sunny spot when a few inches high in April and trained up a trellis, canes, garden structure or even up more sturdy plants with a little care and attention. Come mid summer and the blooms bloom, the scent fills the garden and if you keep picking bunches as they flower you will have a sweet scented home and more and more blousy blooms – plenty to give a posy to your neighbour or friend or to your very own sweet pea. 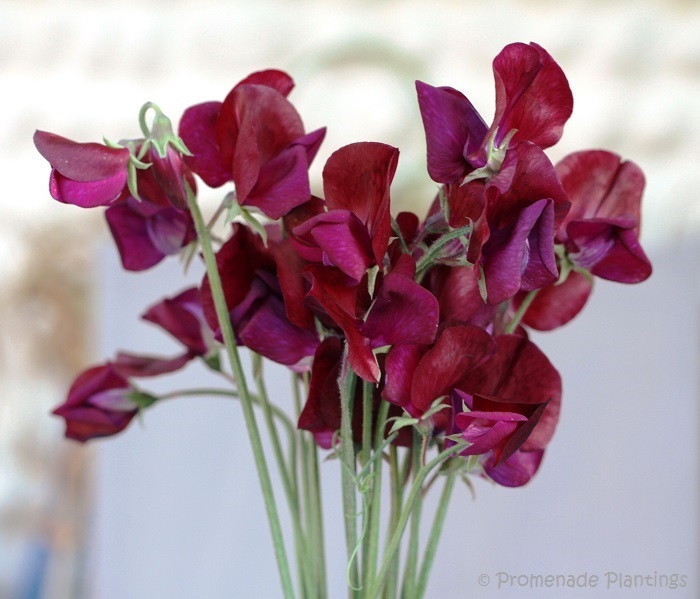 They make perfect cut flowers and for the home or novice gardener are easy to save seeds from; simply let some of the best flowers from the whole of the plant go to seed, and when the pods are papery and dry bring them indoors to finish drying. 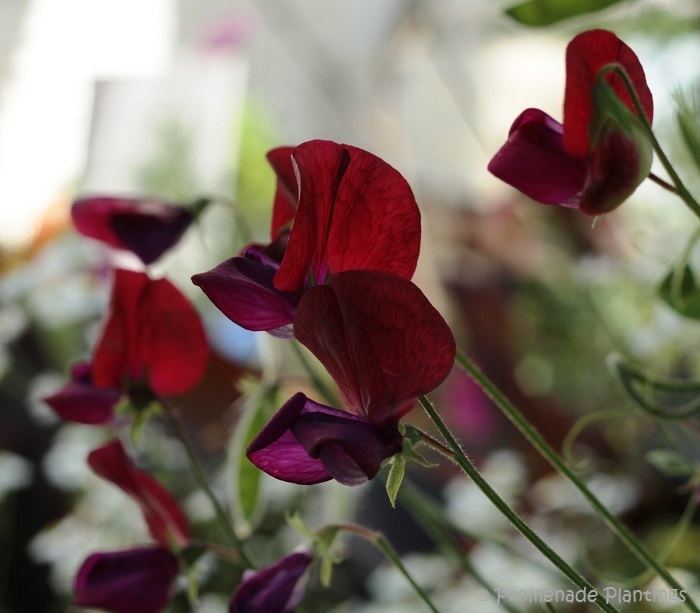 For more information on growing sweet peas check out the National Sweet Pea Society. Instead of buying some hot house flowers for your sweet pea on Valentines day why don’t you sow and grow your own sweet peas this year and sow some blissful pleasure? Talking of gifts for my sweet pea, I’ve been busy creating cards and postcards – adorned with images I’ve taken in my garden, my allotment and when allowed out and about. I plan to use them as gifts, notes and maybe sell a few; I’m sure the Black Knight Sweet Peas will be featuring! Making cards out of photos of your sweetpeas sounds fab! Maybe I will try some this year, as I now have the space with my allotment. So, you plant them now? Hmmm….I start to see where I went wrong last year! Gorgeous color Claire. I remember my Grandmother had a lots of colorful Sweet Peas growing along a fence and the smell was heavenly. I did not know that “now” is the time to sow the seeds? Thanks for the information on this. I am going on a hunt for “Black Knight” seeds as the hue just knocks me out. Great post. I am sure your sweat pea will be tickled pink to get a bunch tomorrow. Well Glenda they were sown yesterday – on a cold wet and windy day! Your sweet peas are gorgeous. I have never had this beautiful colour in my garden. I too use a variety of terms of endearment. Have a super day Claire. I have the scent of hyacinths filling the sitting room at the moment – but I can’t wait for summer! I love annual sweet peas, and have been growing them for years…nothing fancy, just the simple colors. Their scent is heavenly! After seeing your lovely photos I’m set to travel to the Framers Market to find sweet peas! That deep dark red is wonderfully dramatic, especially grown solo, which is how so many seeds are sold here. A good idea for that ugly trellis I have here! By the way, how tall do they grow in England? I used to need a ladder to harvest Papa’s (here on Queensland’s Sunshine Coast). I wish they would grow in SA too – I’m presuming your summers are too hot Tandy. I use ‘sweet pea’ as an endearment, also. I think I picked it up from my mother. I haven’t grown sweet peas in years, but I did at one time. I love them. They have the most delightful fragrance and they remind me of my grandmother. They are one of those simple flowers that really makes a big impression when in a small cluster. I don’t think I’ve ever seen sweet peas that gorgeous deep color you’re showing. I’m mostly familiar with pastels. You have me thinking about preparing a little area for next year! I hope you have a delightful Valentine’s Day, Claire. They look so luscious, I can almost smell them. Happy Valentine’s Day, Claire. Definitely rewarding – scent, colour and long lasting in the garden too! I love the scent of sweet peas. I must plant some this year! definitely a must for your newly landscaped garden! Oh my, I enjoyed learning the history of these favorite flowers. I love this gorgeous deep color. I haven’t grown sweet peas in a few years since I live in an area with a short spring, meaning it gets hot quickly, but I do love these flowers! I might this year! Happy Day! I love sweet peas and feel like I haven’t seen any in years…I’ll have to see if they’ll grow here. I wonder if it’s too hot? I think it might be for regular planting. I’ll see if a shady spot early spring works, or perhaps an indoor start and a fall transplant…might not work but worth a try in case it does! Hello Claire, beautiful photos. 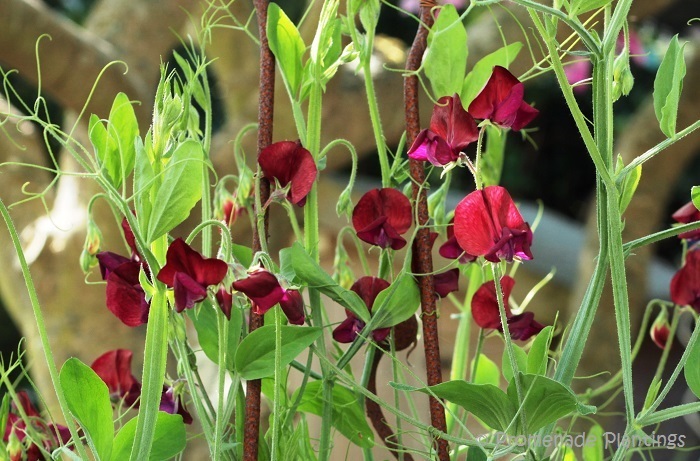 I never knew that sweet peas would develop into those beautiful deep red blooms, how gorgeous. Oh yes, that’s the beauty of planting the very old varieties isn’t It, wondering how far back others enjoyed charting the same growth you’re seeing…and thinking of how they prepared the veggies or placed a vase! I can never get very excited about “new” seeds the way i do old ones…although i buy and plant both! Great post, Claire and now I’m off to read your next one! there are wild cultivars, not as highly scented and much smaller flowers, but still just as beautiful. I so love Sweet Peas, they are one of my most favorite of flowers. When I grew up I could grow them everywhere. Where I live now they don’t seem to like my yard. It’s all so sad really!